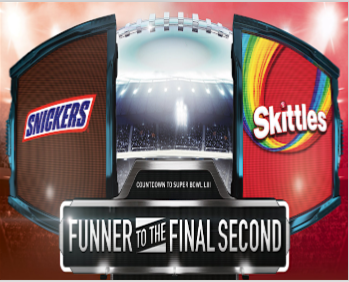 SNICKERS + SKITTLES + M&M’S Funner to the Final Second Sweepstakes & IWG – Win a trip to the Super Bowl! ENTER SWEEPSTAKES HERE – Snickers Sweepstakes page. ENTRY LIMIT – Limit one (1) Grand Prize entry and one (1) Instant Win entry per person or e-mail address per day, regardless of the method of entry. ELIGIBILITY – The SNICKERS ® + SKITTLES® + M&M’S® Funner to the Final Second Promotion is offered only to legal residents of the 50 United States and the District of Columbia, who are 18 years of age or older at the time of entry. SWEEPSTAKES ENTRY PERIOD – Promotion starts on or about 12:00:01 a.m. Pacific Time (PT) on December 3, 2018 and ends at 11:59:59 p.m. PT on February 3, 2019. PRIZES – Grand Prize (1): Trip for two to Super Bowl LIV in 2020 in Miami, Florida. Trip consists of: two (2) tickets to Super Bowl LIV (location/level to be determined by Sponsor); round-trip coach class air transportation for the winner and one (1) adult guest (who is age of majority in his/her state of residence) from a major commercial airport near the winner’s home to Miami, FL (airports determined by Sponsor; if Grand Prize winner resides within two hundred fifty (250) miles of destination, Sponsor may provide ground transportation in lieu of air transportation); ground transportation in Miami between the hotel and airport; four (4) nights’ hotel accommodations in the form of one (1) standard room, double-occupancy (hotel to be determined solely by Sponsor) (room and tax only); and two(2) $250 prepaid debit cards. ARV: $14,000. WINNER’S LIST – For a list of winners of prizes with a value over $25, send a self-addressed stamped envelope for receipt by February 3, 2019 to: SNICKERS ® + SKITTLES® + M&M’S® Funner to the Final Second Promotion – Winners’ List Request, c/o TPG Rewards, Inc., 29 Broadway, Suite 1400, New York, NY 10006. Limit one request per person/household address.